15. Yoga mat: In the course of only a couple of decades, yoga has gone from a relatively unknown activity to completely mainstream. Some yoga studios regularly schedule kids' classes, and even schools have begun offering yoga as physical education (with mixed results, unfortunately). There is absolutely no "religion" in any of the yoga classes I've attended over the years — it's all about deep breathing, deep stretching, and clearing the mind — but yoga did start out as a religious practice and still is used that way by millions of people. Let's not forget to make that connection for our children! Available on Amazon: $15 and up. 18. 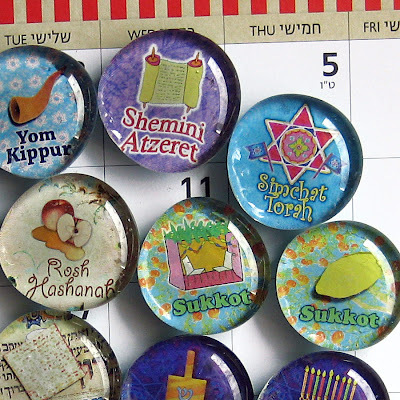 Jewish Holiday Calendar Magnets. One of the best ways to teach kids about Judaism is to honor some of the many Jewish holidays. There are plenty to choose from — and this 14-piece magnet set can attest to that. Most Jewish holidays center on significant events and legends from Hebrew history. I adore these magnets, which can be used as space holders on magnetic calendars or as conversation starters for little ones. Available on Etsy: $16 for the set. 19. The Golden Rule by Ilene Cooper. This is a must read, in my opinion. Gorgeously illustrated by Gabi Swiatowska, The Golden Rule tells the story of a little boy who sees a billboard while walking with his grandfather. The billboard says, "Do unto others as you would have them do unto you." What follows is a sweet, poignant discussion about "the Golden Rule," where it comes from (it predates Jesus by a lot) and why it's so important. It also goes through each religion's iteration of the Golden Rule. I love this book. For children ages 4 to 10. Available on Amazon for $11.53. 20. Pocket Buddhas.Because they're small, cute, and — well, do you really need a third reason? Available from Amazon: $8.95 apiece.